Happy Monday!!! Today I’m so excited to FINALLY be sharing Jackson’s nursery with you all! I know he’s already eight months old but we tried to have it done before he came and it just didn’t happen. Life gets so busy sometimes and after working on the space for several months now it’s finally complete and I love it so much! I feel like I’m more used to pinks and creams and whites, but I always love to work on masculine spaces as well. This room turned out perfect from my Jackson! Now for the best part!!!!! In honor of Mother’s Day this sunday I thought it would be fun to team up with Oilo Studio and The Baby Cubby for an amazing giveaway! Enter below for a chance to win a $1,000 gift card to Baby Cubby gift card, $500 off an Oilo glider, and a $200 Oilo bedding gift card! His nursery is so cute! 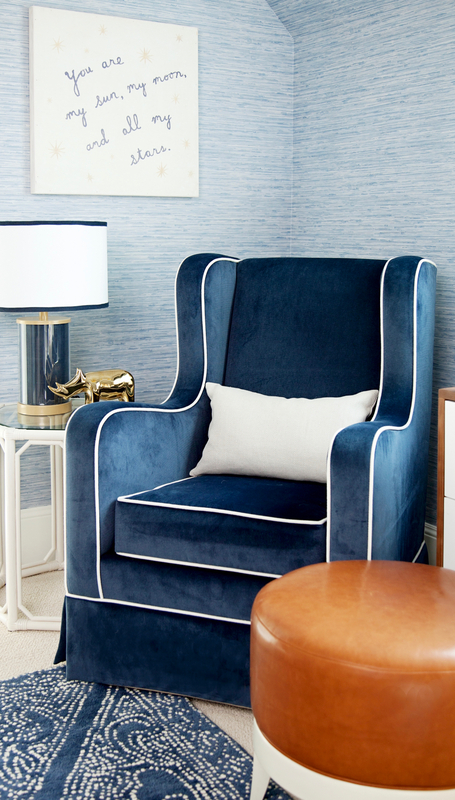 Loving that navy chair. How lovely, You’ve done a wonderful job! Great room colours and decor to transition from a baby’s room into a bigger boy’s room. Hi Claz! Thank you! Yes, I plan to do a home tour soon :) It’s kind of going room by room at the moment! Can you provide a link for the clear bookshelves. Beautiful room! Where did you buy the clear bookshelves? Love everything about his room, so inviting and yet sophisticated!!! This boy room is so so cute, doesn’t seem that you are more into pink and cream tones ;) ! And the photo were you are holding Jackson while he sleeps is so tenderness. Everything you do is just perfect!! Where are the clear book shelves from? 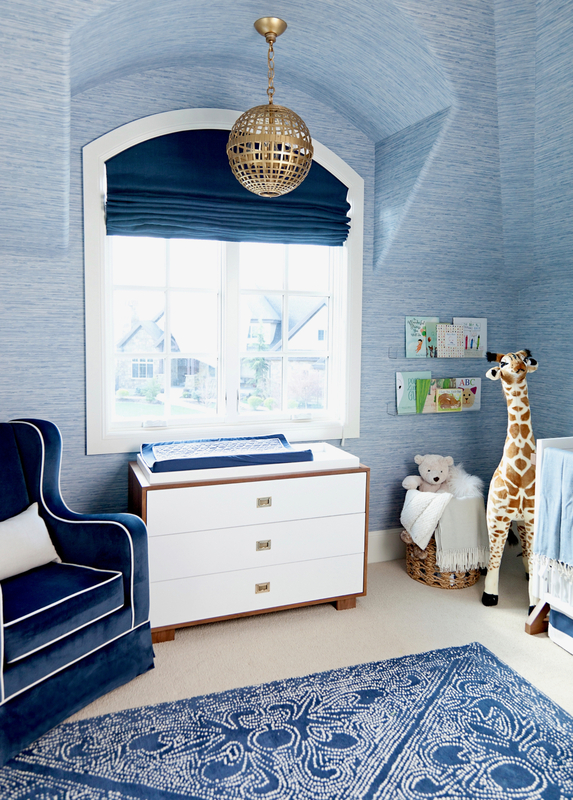 Gorgeous nursery, I’m loving all the shades of blue! Such a beautiful baby and mommy, and handsome nursery!! Love the color combination and world map! 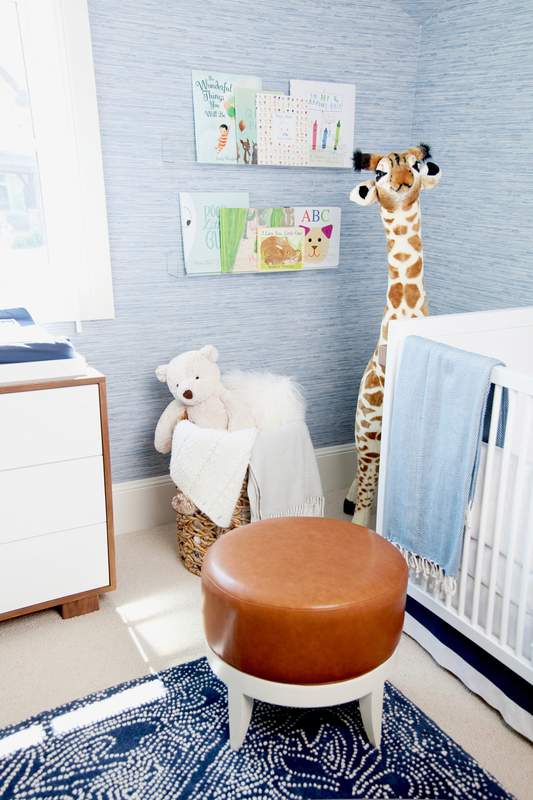 Oh Jackson’s nursery is just divine, Rach! Well done! It’s masculine but beautiful and inviting at the same time. He’s one lucky little boy! It turned out adorable! Love all of the blue ? Wow, Jackson’s nursery came together very nicely. And he has grown so much. God bless.That rug is everything!! Wow, Rach, Jakson’s nursery is so beautiful! I love the the colors you’ve worked with, especially the pops of rich brown, they add such a nice contrast to the white and blue! Thanks for the awesome giveaway as well, I’ve just entered :) I hope you have a wonderful week ahead and thanks for the inspiration! Omg he is so cuteeeee! And I love your dress,its so gorgeous! I can’t believe he is already 8 months old, wow! Such a calming gorgeous baby boy room! Absolutely love! This is stunning…I LOVE the wallpaper!! I love the nursery but I believe your map is hung upside down. Hi Natasha! I know, I realized this morning and I don’t know how we didn’t catch it. Oilo Studio came in and hung everything and I was busy with Jackson so nobody noticed until now! I am obsessed with this nursery! My husband and I are in the process of picking out everything for our gender surprise due in August. It is so fun! You have to realize how absolutely stunning your babes are!! They are literally the most beautiful little gems! I LOVE his room! It suits him so well. You’re a stunning momma! Thank you so much, Terrell! I love them so much! This is the sweetest. He’s getting so big! I love that Dash gets in on the posts with the kids too! Why is the map upside down? This is an absolutely stunning nursery with amazing decor. Such a beautiful room for your handsome little guy! ? Been wondering for the longest time where the ring that you’re wearing on your index finger on the 3rd photo from the top is from? It’s so pretty!! Hi Amanda!! It’s from Walters Faith. I worked with them a couple years back and fell in love with their rings! Love the way you did baby Jackson’s nursery. The colors look so great together! Noticed the world map is upside down? We realized this morning and I don’t know how we didn’t catch it. Oilo Studio came in and hung everything and I was busy with Jackson so nobody noticed until now! Yay I was excited to see your baby’s nursery and I was even more excited when I saw your art canvas my husband works for that company and is one of the guys that helps make them I love it ? it looks so cute in the space , congrats on your beautiful baby ! Oh my gosh, really?! We love it! Love the wallpaper. What was your inspiration for the upside down world map? So interesting! Thanks Jess! And oh my, yes we realized this morning and I don’t know how we didn’t catch it. Oilo Studio came in and hung everything and I was busy with Jackson so nobody noticed until now! What a beautiful room! 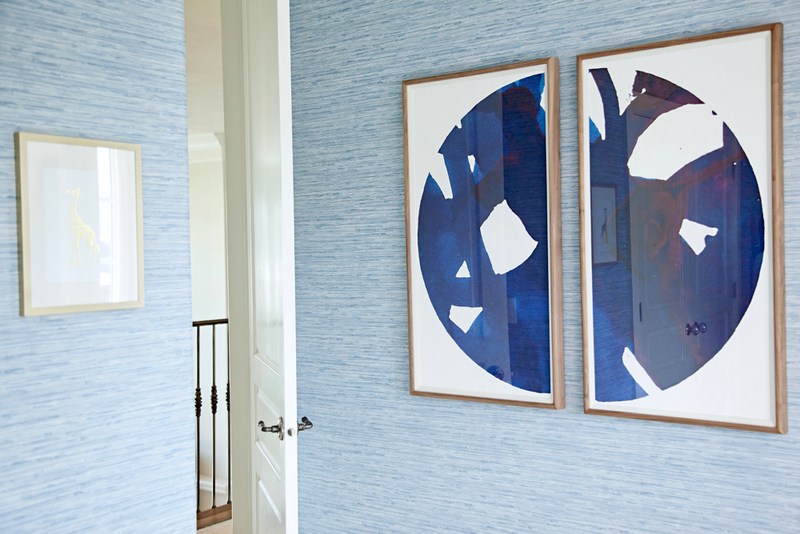 I like the play on different blue tones for a unique take on a boys room. Such a beautiful and creative room! Cute, but the map is upside down. I’m surprised nobody caught that. Thanks Jane! I know, I realized this morning and I don’t know how we didn’t catch it. Oilo Studio came in and hung everything and I was busy with Jackson so nobody noticed until today! Oh my goodness his room is adorable! You did such a great job. I have a daughter, Scarlett who will be 3 in about 2 weeks and a son, Gerard who is just 9months. My husband and I will be renovating our house very soon and when I think of what I want their rooms to look like, my mind instantly thinks of the pictures you’ve posted on your blog and gram. So beautiful and classic and just all around perfect! Thank you for the inspiration! 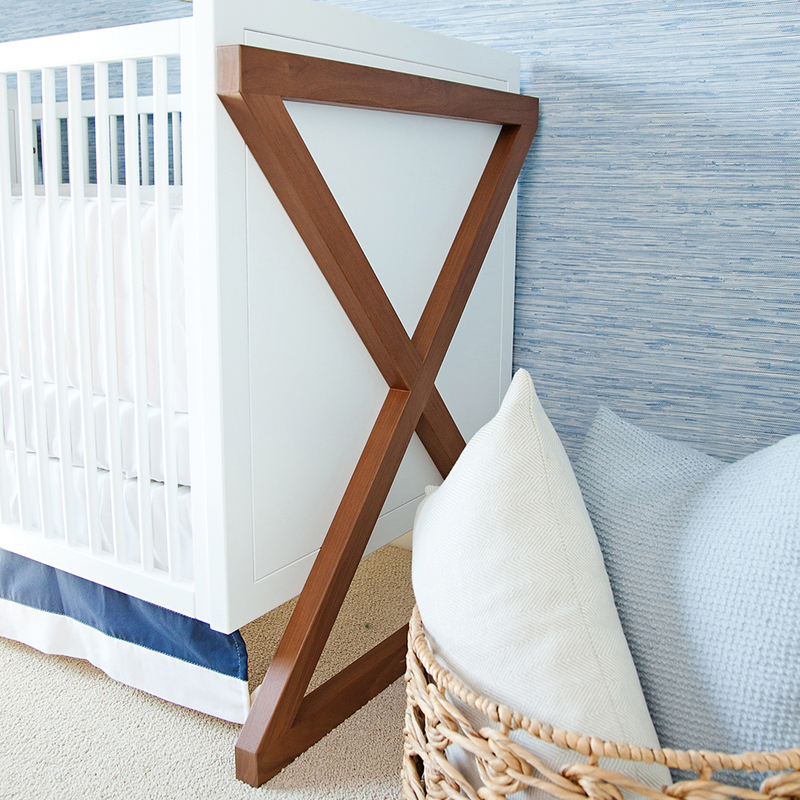 So in love with the this nursery ❤ I love the colors of blue you used! Thanks Ashlyn! I’m really happy with how it came together! You are so sweet!!! I am definitely too busy to notice if a map is hung upside down ;) haha Thanks for leaving such a sweet comment! I don’t think the map is upside down… we are just used to seeing North and South America on the left of a map. Australia is geographically correct by being below the Equator. ? Such a cute nursery! I will be an aunt for the first time in July and my sister doesn’t have much for her baby yet. This would be an awesome gift from tia (aunt) Stephanie! Yes it would!! Crossing my fingers for you and your sister ;) So exciting that you’ll be an aunt so soon! Love his nursery! And these pictures are gorgeous! So beautiful! Where are the bookshelves from? That third picture down of you and Jackson is honestly one of the absolute sweetest pictures I have ever seen!! Thanks Mel! I know, it really makes the room I think! Seriously gorgeous. I love the color scheme with the golds, browns and blues. I like how neutral the wallpaper is as well. I think it’s kid friendly and such a happy room! You guys are so cute, the pics are beautiful! I like the pacific centered map. Beautiful! Would you mind sharing where the clear bookshelves are from? Thanks! Love this room and how you designed it!! The gold accents are perfect with that blue wallpaper!! Nice Job!! Thanks Lauren! I love the gold accents too! Such a precious room. Thank you so much for sharing!! Most beautiful nursery. Wish I could do like that for my boy. I just had baby month ago, I hope I will win Michelle watch, would be the best mother day gift!!! I hope you win too!! I’m crossing my fingers for you ;) And congratulations on your baby! They grow up so fast so cherish every minute! Such a incredible nursery design. You are stunning. I love following you and your crew on instagram. I’d love to win. Rachel this room is amazing and so is your little boy. I’m expecting my second as well and would love to give him a beautiful room. Absolutely stunning! Everything in the room blends in so well ? We just found out we are having our second boy. This nursery made me so excited! It is beautiful! The space turned out beautiful! Love everything! Everything you do is sooooooo classy! Beautiful room! Would you please share where the chair is from please? Can you please share the names of the baby books. Thanks! I love the nurseRy! I was wondering if you had the exact nAme and color of the wallpaper. The link doesn’t seem To go to the Same paper.